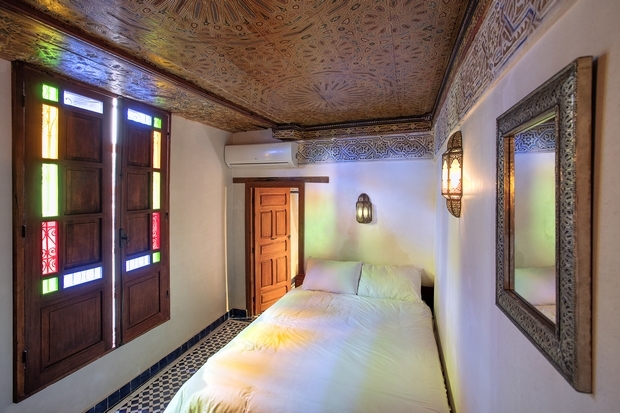 There are five guest rooms available at Dar Drissi. They are each of differing sizes and facilities and each is individually priced. Sizes range from the very large Atlas Salon down to the small Merenid Room. All rooms have en-suite facilities offering a shower, wash basin and WC. The Atlas Salon also has a bath tub of generous proportions. All guest rooms are fully air conditioned for summer comfort and winter warmth. 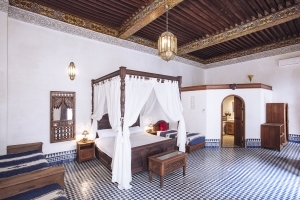 All guests will also enjoy all the facilities and services available at Dar Drissi and you are assured of a warm welcome and attentive service throughout your stay. This room is a very large bedroom / lounge suite with an equally large en-suite bathroom containing a bath, shower, WC and washbasin. The suite also has its own private balcony with seating overlooking the courtyard. The salon consists of a large double bed and three single bed/settees. It is suitable as a family room. We also have a baby's cot. This is free of charge. This is a large salon with en-suite bathroom with WC and washbasin and a separate en-suite shower room. 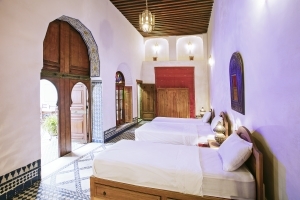 The room is on the ground floor behind magnificent large double doors leading to the courtyard. A small but beautifully decorated double room with a spacious en-suite bathroom with shower, WC and wash basin. 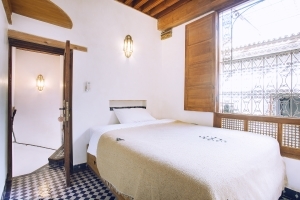 The ceiling has an original wood painted design and the walls are decorated with traditional carved plaster, much of which is also original with the remainder lovingly restored to match. The en-suite bathroom has a low ceiling and the main bedroom door is also low but the main bedroom area has plenty of headroom. A small double room at the top of the house. It has a standard double bed and an en-suite bathroom with shower, WC and wash basin. A window looks out over the terrace and the morning sun will light the room (but will not shine directly onto the bed). There is plenty of headroom in the room, the doorways and bathroom. 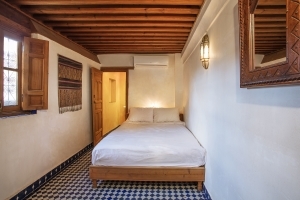 This is the smallest of the guest rooms at Dar Drissi and is priced as a single room. A couple can share for a supplementary charge. There is limited space for your possessions but it has two high corner shelves and two drawers under the bed. There is also some wall hanging space. Sleeps 1 to 2 persons.